Proprioception (PRO-pree-o-SEP-shun; from Latin proprius, meaning "one's own" and perception) is the sense of the relative position of body segments in relation to other body segments. Unlike the six exteroceptive senses (sight, taste, smell, touch, hearing and Balance) by which we perceive the outside world, and interoceptive senses, by which we perceive the pain and the stretching of internal organs, proprioception is a third distinct sensory modality that provides feedback solely on the status of the body internally. It is the sense that indicates whether the body is moving with the appropriate effort and where the various segments of the body are located in relation to each other. Kinesthesia is another term that is often used interchangeably with proprioception, though use of the term "kinesthesia" can place a greater emphasis on motion. Some differentiate the kinesthetic sense from proprioception by excluding the sense of equilibrium or balance from kinesthesia. An inner ear infection, for example, might degrade the sense of balance. This would degrade the proprioceptive sense, but not the kinesthetic sense. 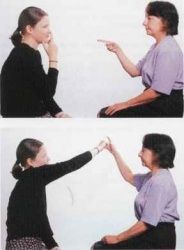 The affected individual would be able to walk, but only by using the sense of sight to maintain balance; the person would be unable to walk with eyes closed. Proprioception and kinaesthesia are seen as interrelated and there is considerable disagreement regarding the definition of these terms. Some of this difficulty stems from Sherrington's original description of joint position sense (or the ability to determine where a particular body part exactly is in space) and kinaesthesia (or the sensation that the body part has moved) under a more general heading of proprioception. Clinical aspects of proprioception are measured in tests that measure a subject's ability to detect an externally imposed passive movement, or the ability to reposition a joint to a predetermined position. Often it is assumed that the ability of one of these aspects will be related to another; unfortunately, experimental evidence suggests there is no strong relation between these two aspects. This suggests that, while these components may well be related in a cognitive manner, they seem to be separate physiologically. Much of the foregoing work is dependent on the notion that proprioception is essentially a feedback mechanism; that is, the body moves (or is moved) and then the information about this is returned to the brain, whereby subsequent adjustments could be made. More recent work into the mechanism of ankle sprains suggests that the role of reflexes may be more limited due to their long latencies (even at the spinal cord level) as ankle sprain events occur in perhaps 100msec or less. Accordingly, a model has been proposed to include a 'feedforward' component of proprioception where the subject will also have central information about the body's position prior to attaining it. Kinesthesia is a key component in Muscle memory and Hand-eye coordination, and training can improve this sense. The ability to swing a golf club or to catch a ball requires a finely-tuned sense of the position of the joints. This sense needs to become automatic through training to enable a person to concentrate on other aspects of performance, such as maintaining motivation or seeing where other people are. Proprioception is what allows someone to learn to walk in complete darkness without losing balance. During the learning of any new skill, sport, or art, it is usually necessary to become familiar with some proprioceptive tasks specific to that activity. Without the appropriate integration of proprioceptive input, an artist would not be able to brush paint onto a canvas without looking at the hand as it moved the brush over the canvas; it would be impossible to drive an automobile because a motorist would not be able to steer or use the foot pedals while looking at the road ahead; a person could not touch type or perform ballet; and people would not even be able to walk without watching where they put their feet. The proprioceptive sense can be sharpened through study of many disciplines. The Alexander Technique uses the study of movement to enhance kinesthetic judgment of effort and location. Juggling trains reaction time, spatial location, and efficient movement. Standing on a Balance board is often used to retrain or increase proprioception abilities, particularly as physical therapy for ankle or knee injuries. Standing on one leg (stork standing) and various other body-position challenges are also used in such disciplines as Yoga or Wing Chun. In addition, the slow, focused movements of Tai Chi practice provide an environment whereby the proprioceptive information being fed back to the brain stimulates an intense, dynamic "listening environment" to further enhance mind / body integration. Several studies have shown that the efficacy of these types of training is challenged by closing the eyes, because the eyes give invaluable feedback to establishing the moment-to-moment information of balance. There are even specific devices designed for proprioception training, such as the Proprioceptor system, which consists of shoes with specially designed balls on the soles to make athletes work harder to balance. Apparently, temporary loss or impairment of proprioception may happen periodically during growth, mostly during adolescence. Growth that might also influence this would be large increases or drops in bodyweight/size due to fluctuations of fat (liposuction, rapid fat loss, rapid fat gain) and muscle content (Bodybuilding, Anabolic steroids, catabolisis/starvation). It can also occur to those who gain new levels of Flexibility, Stretching, and Contortion. A limb's being in a new range of motion never experienced (or at least, not for a long time since youth perhaps) can disrupt one's sense of location of that limb. Possible experiences include these: suddenly feeling that feet or legs are missing from one's mental self-image; needing to look down at one's limbs to be sure they are still there; and falling down while walking, especially when attention is focused upon something other than the act of walking. Proprioception is occasionally impaired spontaneously, especially when one is tired. One's body may appear too large or too small, or parts of the body may appear distorted in size. Similar effects can sometimes occur during Epilepsy. These effects are presumed to arise from abnormal stimulation of the part of the parietal cortex of the Brain involved with integrating information from different parts of the body. The proprioceptive sense is often unnoticed because humans will adapt to a continuously-present stimulus; this is called Habituation, Desensitisation, or Adaptation. The effect is that proprioceptive sensory impressions disappear, just as a scent can disappear over time. One practical advantage of this is that unnoticed actions or sensation continue in the background while an individual's attention can move to another concern. The Alexander Technique addresses these issues. People who have a limb amputated may still have a confused sense of that limb existence on their body, known as phantom limb syndrome. Phantom sensations can occur as passive proprioceptive sensations of the limb's presence, or more active sensations such as perceived movement, pressure, pain, itching, or temperature. The etiology of the phantom limb phenomenon was disputed in 2006, but some consensus existed in favour of neurological (e.g. neural signal bleed across a preexisting sensory map, over psychological explanations. Phantom sensations and phantom pain may also occur after the removal of body parts other than the limbs, such as after amputation of the breast, extraction of a tooth (phantom tooth pain), or removal of an eye (phantom eye syndrome). Temporary impairment of proprioception has also been known to occur from an overdose of vitamin B6 (pyridoxine and pyridoxamine). Most of the impaired function returns to normal shortly after the intake of vitamins returns to normal. Impairment can also be caused by cytotoxicity factors such as Chemotherapy. It has been proposed that even common tinnitus and the attendant hearing frequency-gaps masked by the perceived sounds may cause erroneous proprioceptive information to the balance and comprehension centres of the brain, precipitating mild confusion. Proprioception. (2008, October 8). In Wikipedia, The Free Encyclopedia. Retrieved 10:04, October 20, 2008. Ehrsson, H., Kito, T., Sadato, N., Passingham, R., & Naito, E. (2005). Neural substrate of body size: illusory feeling of shrinking of the waist.